While there aren't currently any zero-calorie cupcakes on the market to satisfy your sweet tooth and preserve your waistline, you can make your own guilt-free sweet treats right at home. Although you can't actually bite into these colorful confections, paper mache cupcakes may just look good enough to eat when you're finished decorating. This is a simple and inexpensive craft project that the whole family can enjoy on a rainy afternoon; display your creative cupcake masterpieces around your home or in the kitchen for some delicious decor. Combine 2 cups of flour to 3 cups of warm water in a bowl. Mix until smooth and set aside. Tear the newspaper into long strips and set them aside. Cover the wastepaper basket with a layer of plastic wrap; this will prevent the paper mache from sticking to it during the project. Dunk your newspaper strips into the paper mache glue mixture and apply them to the covered wastepaper basket. Apply newspaper strips until you have two or three layers of paper. 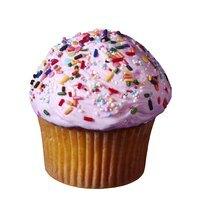 Set this portion of the cupcake aside and allow it to dry for 24 hours. Inflate a latex balloon until it is larger than the circumference of the wastepaper basket. Tie the end off with a knot. Coat with two or three layers of paper mache-dipped newspaper strips and allow to dry for 24 hours. Remove the wastepaper basket and plastic wrap from the dried paper mache. Push a pin through the dried paper mache to pop the balloon underneath. Cut the resulting hollow shape in half to create the lid of the cupcake. Hot glue the lid of the cupcake to the base and then decorate the shapes with colorful paints and other embellishments if desired. Scrunch up bits of colored crepe paper and hot glue them to the lid of the cupcake to create the illusion of textured frosting. How Far in Advance Can You Make Cupcakes for a Wedding?